Major Walter Woodrow Wilson was born in Ripley, West Virginia on 16 February 1923 and grew up in East Liverpool, Ohio. Wilson joined the Army Air Corps during World War II and flew B-24 Liberators over Germany for the 8th Air Force. He remained in the Air Force reserves following the war while working for Western Electric. He was recalled during the Korean Conflict and piloted C-119/KC97 aircraft during that time. He then piloted C-47s in an air-sea rescue operation out of Iceland; was a pilot for the Military Air Transport Service from McGuire Air Force Base; was a pilot of C-124 aircraft from Barksdale Air Force Base. He then servied as a Launch Control Officer for the Titan Missile System at Larsen Air Force Base. He then was a C-47 pilot and helpted to establish the training program for "Spooky" gunships. Finally, he was a C-130 pilot with three temporary duty assignments to Vietnam during the war there. 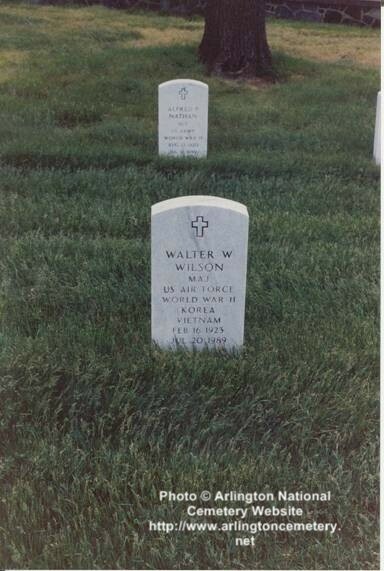 Major Wilson died on July 20, 1989, at the Vetarans Administration Hospital in Pittsburgh, Ohio, and was buried with full military honors in Arlington National Cemetery.